Published on September 18, 2018 in general info. 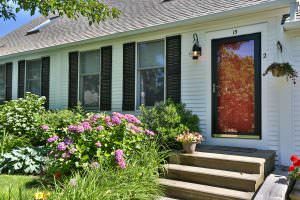 Closed Tags: Cape Cod condo sales, Cape Cod Luxury condo sales, Cape Cod real estate, Provincetown condominiums, Provincetown luxury homes, Provincetown real estate. 15 Mechanic Street #2 is a three bedroom three bath condo with 1,400 square feet on three floors. It is in a four unit condo association that looks like sweet cape cod cottages from the street view but inside have spacious, mostly updated interiors that belie the traditional exterior. It was listed for $995K and sold for $995K. MLS REMARKS: Ideally located in Provincetown’s west end, between Commercial and Bradford Streets, this tri -level townhouse is a real gem. The soaring cathedral ceilings as you enter sets the mood for this beautifully designed home. The living area with its richly stained floors and wood burning fireplace with concrete surround is warm and inviting. The dining space is just off the kitchen and leads to the attached deck which is great for entertaining or those lazy afternoons. The Kitchen is a cook’s delight with induction range, vented hood, wine cooler, farmer’s sink, poured concrete countertops, stainless appliances and custom cabinetry. The wood and steel cable banisters have a nautical feel and lead to the 2nd floor master bedroom with attached bath. The master bedroom is light filled with oversized windows that overlook Ptown’s quaint west end. The master bath features radiant heat, floating vanity, porcelain tiled floors and glass shower enclosure. Providing privacy to you and your guests, two floors below with an outside entrance, are two bedrooms that share a newly renovated bath with oversized shower. This level has radiant heat flooring throughout. Ductless a/c ‘s, a half bath on the entry level, in unit laundry, off-street parking and a common patio/grill area round out this fine offering.